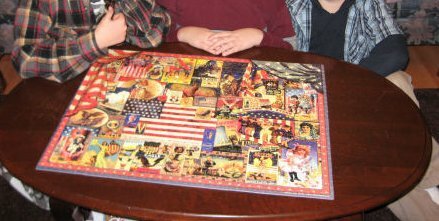 Does anyone know where I might find inexpensive jigsaw puzzles? The kids are really “into” jigsaw puzzles lately. We spent two nice, quiet days working on a complicated 1,000 piece jigsaw puzzle, and it was so much fun! I’ve checked Amazon, Walmart, Target, etc. Most puzzles seem to be priced in the $20 range, too expensive for my taste (yikes, you can get 8GB memory sticks for that price now; are puzzles really so expensive?!). Does anyone know where I might find some 1,000 piece or higher puzzles? ← Where’s That Holiday “Team Player” Spirit?? Hobby Lobby has great puzzles, and if you wait for their 40% off coupon it is even better. Thanks for the suggestions! Here’s what I’ve done– I did check the Dollar Store, but only found small puzzles (100- 500 pieces). Great prices, but the puzzles are too small. I’ll check other Dollar Stores in the area when I drive out further. I will have the check thrift stores.. I’ve always avoided their toy area just because I never thought the puzzles would be complete. But I’ve got nothing to lose, really, so I’ll be sure to check ! And thanks for the Hobby Lobby tip– I’ve never heard of them so it will be great to look there. Big Lots may have them. I’m not sure what’s close to you, but Hobby Lobby sell them fairly cheap and sometimes on sale. There are always coupons too. Also, coupons at Joann’s Fabrics (yes, they usually sell jigsaw puzzles too). I’ve found them frequently at 2nd hand shops and Goodwill for really cheap! You might check garage sales and flea markets too. I know when the school at our church has their annual garage sale, they had very cheap puzzles that people donated. Afraid I don’t have any suggestions… my kids are still in the 300-500 piece stage. In fact, we’re working on a 300-piece puzzle right now… what a great holiday activity. I’d be a bit leery of garage sales and the like… when I was a kid, my parents would get me 1000-piece puzzles from garage sales or flea markets and the puzzles would always be missing a strategic piece or two. Then again, at 10 cents then and a dollar today, the price was right. To compensate for the missing pieces, our family developed a story about how my Aunt Vi would come and visit for the holidays and slip a piece from each puzzle into her purse. I’ve picked up great inexpensive puzzles at Walmart. They were Hometown puzzles, 1000 pieces, and in smaller sized boxes. We’ve had great fun with them. Another great place to buy puzzles is garage (tag) sales. Not the right time of year for that, tho. I have a large supply of puzzles and would gladly sell you several for $1 each plus the cost of shipping. And I guarantee no missing pieces. Big Lots is another good place. I’ve actually seen 1000 piece puzzles at walgreens for a few dollars a piece. And you know they always have those good coupons on their website. I always find that you can find the greatest things on eBay! So maybe you could try looking there. Also thriftstores of course, and perhaps garage sales? Clara, I will keep you on mind. Thanks! WALGREENS! I forgot all about them! Will have to check. There is no Hobby Lobby close to me. I’ll check Joanns’s Fabrics!